This is a simple patch (ESP replacement) for "Dawnguard Vampires - No Dirt Tintmasks" (01VampireNoDirtTintmask.esp ) by Jowain92, to make it compatible with Unofficial Skyrim Legendary Edition Patch (USLeEP or USLEP) by Arthmoor. Jowain92 for the original mod, Arthmoor for USLeEP. Fixed typo in the folder name inside the 7Zip file. No other changes; did not increment version number. You don't need to re-download 1.0. Update: This patch and the mod it patches are effectively obsolete if you use Skyrim Race Records Master (recommended for TES5Edit-skilled users only). 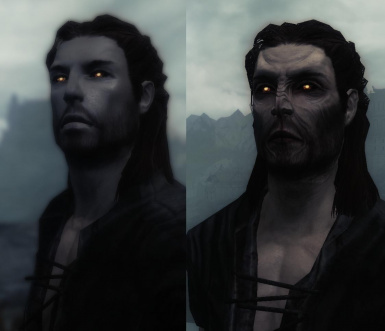 This is a simple patch (ESP replacement) for Dawnguard Vampires - No Dirt Tintmasks (01VampireNoDirtTintmask.esp) by Jowain92. DVNDT was released right after Dawnguard, and preserves several errors in the vampire race records. These were fixed in Unofficial Dawnguard Patch (UDGP, now obsolete) and the later Unofficial Skyrim Legendary Edition Patch (USLeEP or USLEP) by Arthmoor, but using DVNDT would undo those changes. A few minor tweaks like Khajiit attack angles, etc. This patch was not made for No Dirt on Vampire Faces by Conny Bengtsson. That's not really a mod, but a blanked-out texture file (maleheaddirt_01.dds), which a) would affect any race using it, and b) not remove all the dirt from even the male vamps, much less the female ones. Just put this new 01VampireNoDirtTintmask.esp in your game's Data directory, overwriting the one from the original mod. I claim no credit for anything in this other than copying records around. USLeEP is the work of Arthmoor and friends, and DVNDT was made by Jowain92.